Sixteenth full-page Illustration for Dickens's A Christmas Carol in Prose: being a ghost story of Christmas in the Ticknor and Fields (Boston), 1869, Diamond Edition. He left the room, and went up stairs into the room above, which was lighted cheerfully, and hung with Christmas. There was a chair set close beside the child, and there were signs of some one having been there, lately. Poor Bob sat down in it, and when he had thought a little and composed himself, he kissed the little face. He was reconciled to what had happened, and went down again quite happy. The reader now notices, if he or she has not done so before, that the story's characters often suffer personal loss at Christmas, and that Marley, Scrooge, and Tiny Tim all die at Christmas, yet another instance of Victorian coincidence. 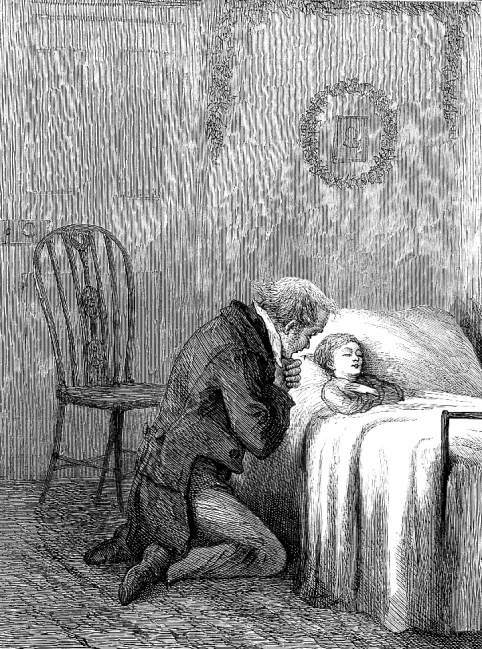 Compare Eytinge's rendering of the dead or dying child here, with his arms crossed on his chest, with that of Little Nell in "At Rest" by George Cattermole for Chapter 71 of The Old Curiosity Shop in the serial illustration for 30 January 1841 in Master Humphrey's Clock. Dickens, Charles. A Christmas Carol in Prose: being a Ghost Story of Christmas. Il. Sol Eytinge, Jr. Boston: Ticknor & Fields, 1868. Hearne, Michael Patrick, ed. The Annotated Christmas Carol. New York: Avenel, 1989.